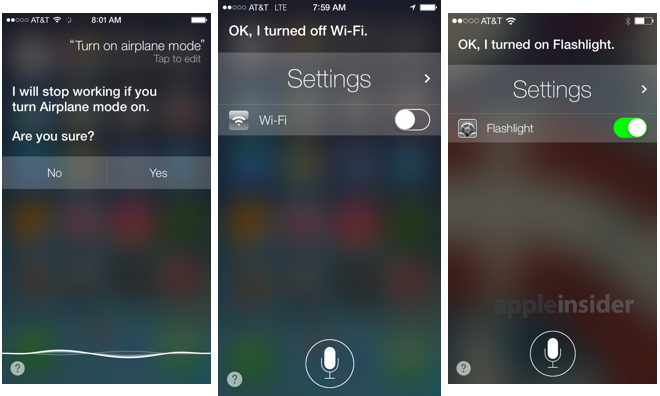 By holding the home button and invoking Siri, users can issue a command such as "increase the brightness," or "turn off Bluetooth." Users can also enable or disable the new built-in flashlight functionality. When asked to turn on "Airplane Mode," Siri will even warn users that it will no longer be functional, as the software requires an Internet connection to operate. Settings that are changeable are accompanied by onscreen controls that a user can manually change by tapping. 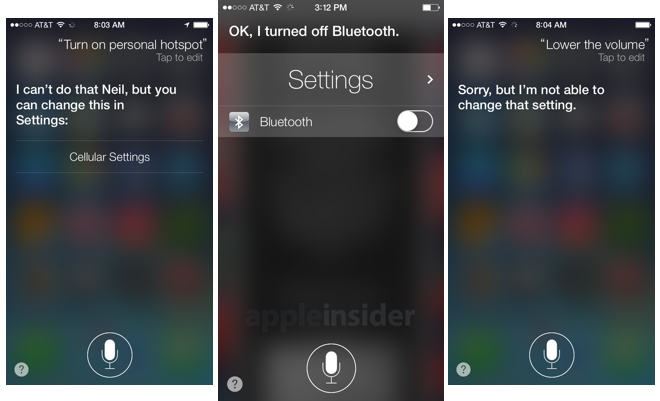 For functions that Siri is not able to accomplish, such as enabling "Personal Hotspot", disabling LTE, or turning off location services, the system provides a quick link to the respective section in the Settings application. On some settings, such as lowering the volume, Siri simply responds by saying it can't be done. It's possible such capabilities could be added to iOS 7 before its public launch this fall. Siri is also able to play new voicemails, return missed calls, and is compatible with the new iTunes Radio feature in Apple's official Music application. Users simply ask Siri to play a saved radio station from iTunes Radio, and it will begin streaming with a tappable link to the "Now Playing" screen. Siri will gain new voices when iOS 7 launches this fall, but they are not available in Apple's first beta for developers. 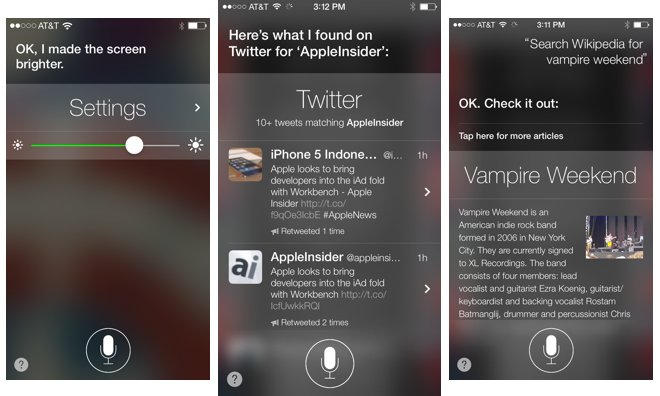 With iOS 7, Siri also gains the ability to embed search results directly from Wikipedia, Twitter, and Bing. The default search engine has also been changed to Bing, rather than Google.
" By doing this, Siri will simply open up the Safari browser with a Google search result. The same can also be done with searches on Yahoo, Twitter and Wikipedia, but users cannot currently search online storefronts like Amazon, or even Apple's own iTunes. Siri also has a new look that fits in with the redesign of iOS 7. Once activated, the software fades into view on top of whatever is currently on the screen, and a new wavelength at the bottom of the display shows Siri listening as a user speaks. Apple has also promised even further changes to Siri that are not currently available to test in the first iOS 7 beta. Specifically, Siri's voice will be changing to become "clearer" and "more natural-sounding." When iOS 7 becomes available this fall, users will also be able to choose between a female or male voice when interacting with Siri. Those voices will initially be available in U.S. English, French, and German.